Liverpool ONE Foundation worked with Radio City and a group of young people from Merseyside Youth Association and YPAS to create some pieces for radio to try and encourage people to talk more about mental health. HYPE's project Park was funded by #iwill and was match funded by One Ark Housing Association, in order to engage local young people aged 15-24 years throughout the summer holidays and continue to support them to make a positive impact within their communities. The luxury menswear retailer is dressing Union House in a lavish video wall for charity with big names including Liverpool Gin and high end fashion brands getting involved. Merseyside Youth Association (MYA) are seeking providers to deliver a number of services. Applications are open for the first round of funding from the Merseyside Women’s Fund. Jamie Carragher’s 23 Foundation is set to fund food banks in North Liverpool and South Sefton to support those in need over the summer holidays. Projects which tackle knife crime, provide intensive support for vulnerable young people and protect them from grooming are among 14 grassroots initiatives which have been awarded funding from the region’s Police Commissioner to build safer, stronger communities. Charities and community groups are being encouraged to apply for funding to make Merseyside a safer place to live and work. The High Sheriff and Merseyside Police Charitable Fund is encouraging charities to apply for funding to promote community safety. Merseyside is full of heroes – ordinary men, women, boys and girls who do extraordinary things – and this is your chance to salute them. The Community Foundation for Merseyside (CFM) is delighted to announce the launch of the new Merseyside Women’s Fund after its national membership body UK Community Foundations (UKCF), secured a record £3.4 million award from the DCMS Tampon Scheme. This is the largest grant awarded to any organisation from this fund. The Community Foundation for Merseyside is proud to be working with the Echo Environment Awards 2018. Thirteen grassroots organisations have been awarded a share of £135,000 from a fund run by Merseyside Police Commissioner’s for projects which are working to build safer communities. Age UK, a recent beneficiary of the Knowsley Foundation Enterprise Grant Fund, transforms a local community centre. More than 11,300 young people will benefit from projects which will keep them away from dangerous activities this Halloween and Bonfire Night, thanks to funding raised by the police from the sale of stolen goods. Young person's drop in for emotional health and wellbeing: Star Centre opening times. Our friends at Wirral Connect are currently offering a Education and Training course which is heavily discounted for local charities! We caught up with her in to ask why she supports the Community Foundation for Merseyside. Big Potential, a Big Lottery Fund grant fund, is delivering approximately £20m of grant funding over 3 years to charities and social enterprises with the aim of improving their sustainability, capacity and scale and enabling them to deliver greater social impact. More than 12,000 young people will be able to join projects which help to keep them away from dangerous activities this Halloween and Bonfire Night, thanks to funding raised by the police from the sale of stolen goods. In 2015 the Liverpool ONE Foundation awarded Thinking Film Ltd funding for an exceptional project working with young Lesbian, Gay, Bisexual & Transgender (LGBT) people, across Merseyside, who have experienced Homophobic, Biphobic or Transphobic (HBT) bullying. Twin Vision worked with bereaved children and young people from across Merseyside which gave then a unique opportunity to make animations which celebrated positive memories of each of their loved ones. 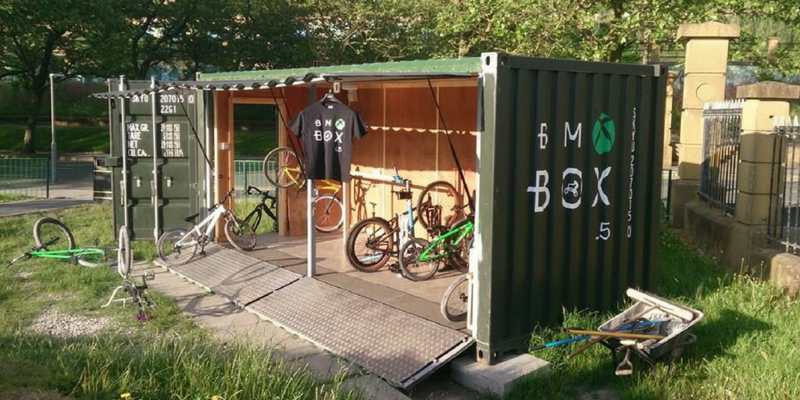 Funded by the Liverpool ONE Foundation in March 2016, BMX BOX is social enterprise Peloton’s latest community project. Lotus Brook Ltd offer educational workshops to people interested in growing food in small spaces. We were delighted to be invited to the Bale Beautification day earlier this month! The event was proudly funded through the Hill Dickinson Foundation. Xplode Magazine who work across the UK assisting 12 to 22 year olds with their employability skills, have been honoured with the Queen’s Award for Voluntary Service, the highest award a voluntary group can receive in the UK. Voluntary Sector Partnership welcomes new chair, starts work on a devolution manifesto for Liverpool City Region. Catalyst Performing Arts uses Police Property Act funding to raise awareness of the dangers of drinking in a creative and innovative way. Catalyst delivers a variety of arts-based workshops to young people aged between 12 and 24 years from socially disadvantaged backgrounds who are often low achievers at school. In December, the Community Foundation’s Philanthropy Fellowship hosted an event at the Unity Theatre with special guest and patron Cherie Blair.